The church of Virgin Keriotissa is a real ornament, not only for the village of Keri but for the whole island. The initial form of the church is unknown to us. Today`s building has been renovated in 1745. This date is incised above the southern entry of the church. The church was renovated in 1953 (after the earthquake) , maintaining its initial architectural style. 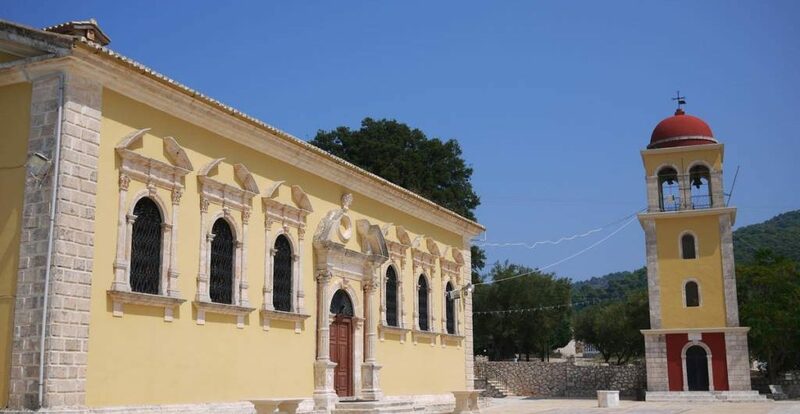 The temple contains important works of art that honour the development of the fine arts in Zakynthos (Zante). The woodcut and gold-plated baroque style temple, was made in 1750, from Ioannis Gropas and Nikolaos Logothetis. In the parapet of the loft, a disingenous picture presenting the litany of the picture of Virgin Mary Keriotissa in the times of Venetians, is portrayed. The creator is unknown to us. The picture presents real persons of that season who follow the litany, wearing interesting local costumes, but also presents the belfry that used to be there in these old times. Among the several monumental silver-gilted works, dominates the old Gospel (dates in 1842) work of Diamadis Bafas. In the position that nowadays the church is located, the ancient picture of Virgin Mary, the Virgin Mary Keriotisssa, (holding Chirst on the right-hand) was found, and till toay is considered the most important piece of temple. This miraculous picture has a silver-gilted encompassment, apart from the faces of Vigin Mary and of Baby Christ. The picture rests on a wooden crafted, golden seat. In the feast of Virgin Mary, on the first and second day of the Easter, the villagers organise a festival with traditional music and dances as well as with local speeches. The adventures of this historical picture are unknown to us till the time it was found. The local tradition says that in 1620, a shepherd that walked his sheeps, used to see a shine every day in the same point among the bushes. He decided that in order to see what hided behind there, he should burn these bushes, and then he found the picture. The picture was partly burned. Being proud, he carried it to his village. The next day the picture was absent from the point where it had been transferred. While the shepherd walked his sheeps, he shaw the picture again in the same point he had seen it for the first time. Thus, the villagers of Keri decided to choose this spot to built a monastery and keep in it the picture. At the heart of Porto Roma, on one of the most colorful beaches, right next to the Ionian, lies Villa Calma, most famous for it’s easy going staff and vacation you’ll never forget.